NEW HAVEN, NY – Standing at the site where her sister disappeared more than 18 years ago, Lisa Buske unveiled the cover of her book on Friday, what would have been Heidi Allen’s birthday. 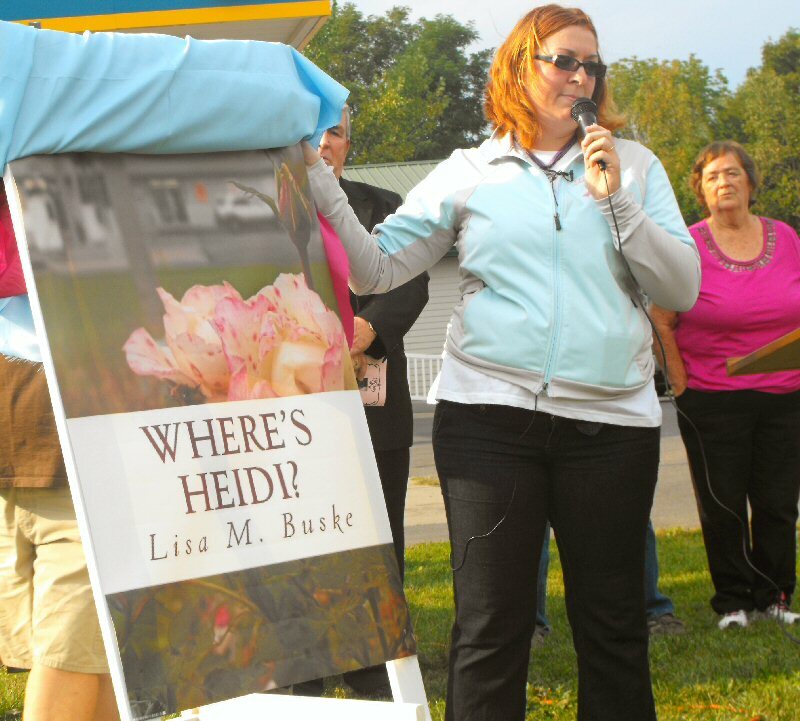 Lisa Buske unveils the cover of her book about her sister Heidi Allen. On April 3, 1994, Heidi Allen went missing from the convenience store at the intersection of Route 104 and 104B in New Haven. Authorities say she was kidnapped by a couple of local brothers and is presumed dead. Her body has never been located. But to this day, the case remains open and police continue to investigate, according to Oswego County Sheriff Reuel Todd. She thanked her parents for permission to write the book in the first place. They told her she didn’t need their permission; but if they hadn’t given it, she would have written it, but it would have just sat in a filing cabinet somewhere, she added. It was a fun journey and a difficult journey, she said. Heidi’s mom, Sue Allen, is comforted by her husband, Ken, as she remembers her missing daughter. 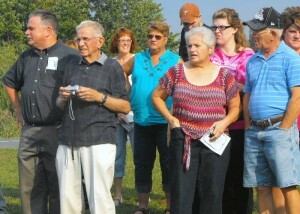 Looking on are Sheriff Reuel Todd and Heidi’s sister, Lisa Buske. There are four different things going on on the cover. It reflects the New Haven community. It has a rose in the Remembrance Garden, which was created by the community to remember Heidi. The focal point of the cover is the rose. It bloomed on April 3 this year. In the background is the store. The store is important, because it is family, too, she said. Elizabeth Baker signs the table covering at the Heidi Allen book cover unveiling Friday afternoon. 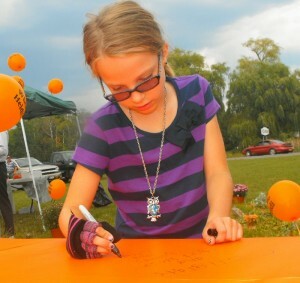 Dozens of others also inked their sentiments and congratulations to the author Lisa Buske, Heidi Allen’s sister. The cover is like a map that represents everyone in the community. “Instead of viewing this as a place of tragedy, let the store fade into the background and focus on the hope in front of you. Only God could bloom a rose on the very day that it snowed 18 years prior. This isn’t a place of tragedy, it is a place of hope. The community put the garden here to keep us hopeful. So, don’t give up,” Buske said. “We will always be working on this case, absolutely, until we bring Heidi home,” Sheriff Todd vowed. After Heidi disappeared, Buske couldn’t find anything written that helped siblings cope with such a loss. Lisa Buske and Sheriff Reuel Todd share a laugh as they field questions from the media on Friday. Her book is to help other siblings know that they’re not alone. Her first draft was done in 2006; something the author now describes as emotional vomit and was written in three days. 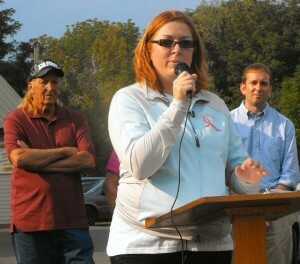 Lisa Buske wrote a book about her sister, Heidi Allen. However, she admits that she hasn’t actually read it from cover to cover yet. Despite some people saying (losing someone) gets easier over time, Buske said that really isn’t true. Whether her sister might ever be found leaves Buske with mixed emotions. According to “evidence,” they are looking for remains, she said without going into further detail. A small part of the crowd that was on hand for the book cover unveiling listen to Lisa Buske talk about remembering Heidi Allen. 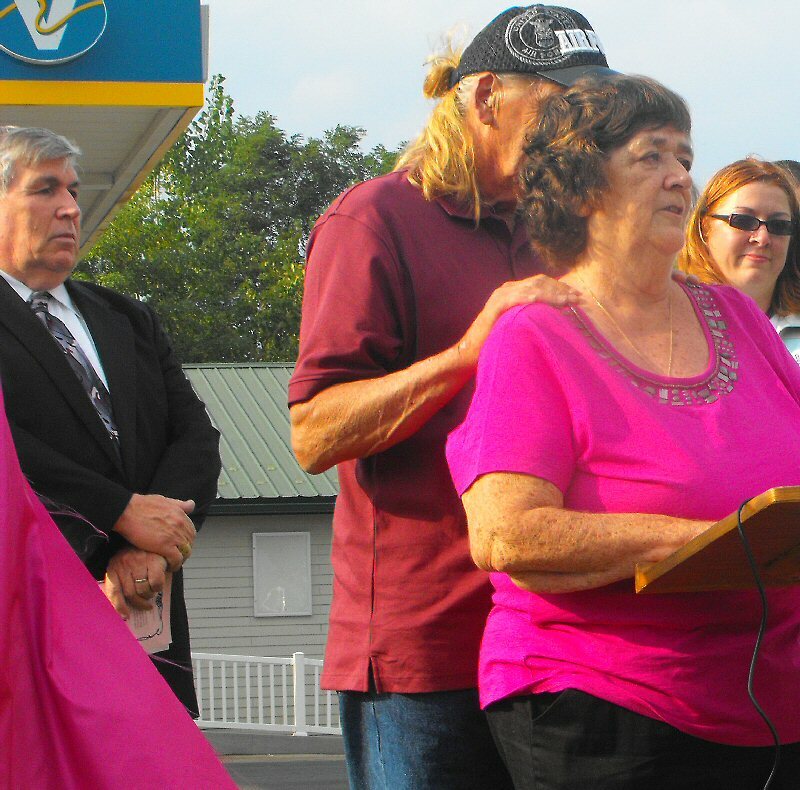 “We won’t forget her and we will continue to work to bring her home,” the sheriff added. A member of the media asked the sheriff if he’d retire if Heidi were to be found in the near future. She has received a lot of response since she began blogging about her sister. Hopefully, people will remember things that they thought might not be important but could help make the connection. “You never know what missing puzzle piece it is. The little things could be important,” Buske pointed out. Losing Heidi was difficult, her mother, Sue Allen, told the large crowd circling the Heidi Allen Memorial Garden near the store. 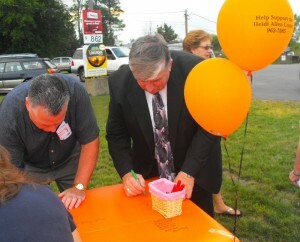 Rick Hogan, left, and Sheriff Reuel Todd sign the table following the unveiling of the book cover. Thank you Steve for writing such a wonderful piece. 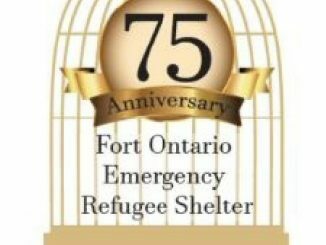 Thanks to our fabulous community too. The article doesn’t say two brothers were convicted. The sheriff just said “someone” was. For the record: In a previous interview with Oswego County Today, Lisa told me she couldn’t understand how one brother was convicted and the other one wasn’t. I just wrote a big article and lost it. I went to school with your dad and when i heard his daughter was missing. I prayed a lot and with the rose blooming the same day God is with you all and it is telling you something. I hope and pray good news Amen.